But that’s crazy talk, isn’t it? Gotham has given birth to many heroes over its illustrious history and not all of them have to depend on massive inherited wealth or go into an impassioned monologue about the tragedy of their murdered parents… though, admittedly, that’s a pretty traumatizing trend. If you ask us, our bets are on you in your amazing Batgirl costume. 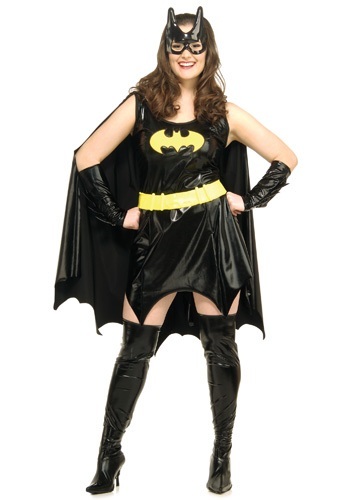 With your black vinyl minidress incorporating the iconic bat symbol, matching cape, boots, and spiked gauntlets and the artistic contrast of the yellow utility belt, you are every bit the hero that Batman could ever hope to reach—and you don’t even need to halt your heroics to wonder if this is how your father would have hoped to see you grow up! I love it, I'm around a size 18-20 with a large chest and it fits perfectly! I love all the detail in this! Material is thin, but breathable...not sure how forgiving it it is in the long run. Was this review helpful to you?YesNo2 people thought so and 1 didn't. I love the way it fits. It has great color & shine to it. I am glad I bought it.